There are a great many challenges that a single mother is faced with, but one of the worst is the feeling of incompleteness that you may experience after the divorce has gone through. 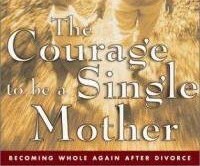 With The Courage To Be a Single Mother: Becoming Whole Again After Divorce by Sheila Ellison you will be able to work towards feeling whole again and fighting against that feeling of incompleteness. The authors in this single parenting book offer a four step program that will help you feel complete. This is a book that will teach you how to cope as a single mother. On top of that it will offer the encouragement and warmth that you need to rediscover yourself. The first step to feeling happy again is to realize that it is not your fault, that you are not to blame and that there is no reason for you to be hard on yourself. On the contrary, according to The Courage To Be a Single Mother: Becoming Whole Again After Divorce you need to learn to love yourself again. In order to be a successful parent you need to find that strength that his hidden deep within you and that you may not even know that you have. The first step to achieving this lies in learning to love yourself. You will find that it is very difficult to achieve your goals if you don’t have any goals in your mind to work towards and achieve. So that is why the second step in this book involves knowing what you want. You need to have a clear idea in your mind of what it is you are trying to achieve. Once you have established what this is you will find that it is suddenly a whole lot easier to work towards your aims. You need to realize that your family is still whole. Divorce is life shattering for everyone involved, but if you accept the fact that your family is still an intact unit that has perhaps merely undergone a few small changes, than you will find that adjusting to a life as a single parent is a whole lot easier. For more information on this step, read this book. Do not let stereotypes about single moms define you. You can choose who you are and you are in complete control of your identity. It is very important that you are aware of this and that you take responsibility of your life and assume control of the situation. You are whoever you want to be, according to this book, and it is very important that you never forget this one little fact.